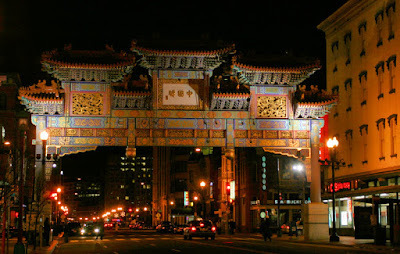 Washington DC’s Chinatown is a historic neighborhood in Washington D.C., Once home to 1000’s of Chinese, DC’s Chinatown has now been reduced to about 20 ethnic Chinese and other Asian and Pan-Asian restaurants and family owned businesses. The first Chinatown in DC was along the south side of Pennsylvania Avenue. Prime commercial real estate.In 1931, a newer Chinatown sprouted between 5th and 7th street. It flourished. At its hight, it was the entire area between G Street and Massachusetts Ave. and 5th Street to 9th Street. was Chinatown DC. After the violent riots due to the assassination of Martin Luther King Jr., many Chinese moved away. The DC Chinatown now is by H and I Streets between 5th and 8th Streets. Though the Friendship Arch that was dedicated in 1986, marking the friendship between Beijing and DC remains, this Chinatown, sadly is not what it once was. Big name franchises such as Starbucks have replaced small, family owned Boba tea shops. But there still are some reason to visit.